AS ONE OF GERMANY'S LEADING LOGISTICS REAL ESTATE BROKERS WE BRING TOGETHER WHAT BELONGS TOGETHER. You are looking for logistics property for your business? Or perhaps you are trying to find a tenant for your logistics space/s? Our thorough understanding of logistics processes and our broad knowledge on the specific logistical requirements of different industries and user groups enable us to precisely classify and rate the importance of individual decision criteria. This way we will identify the perfect logistics property for each type of user. 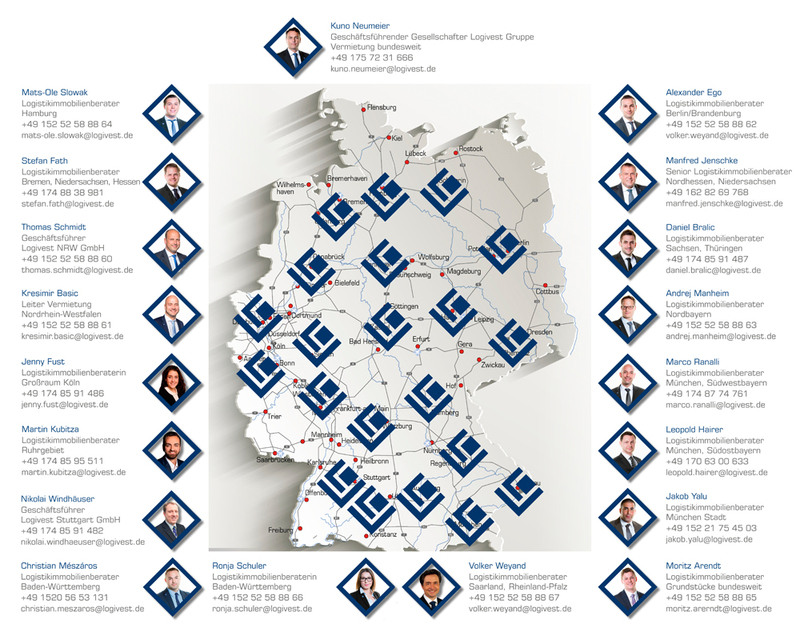 We are one of the leading logistics real estate brokers in Germany. We contribute to our clients’ commercial success, bringing together different market players: tenants/occupiers, buyers and sellers of logistics property, developers, economic development councils, etc. Our background is in the logistics services industry from where we developed into brokers and consultants for industrial and logistics real estate. This was a quite logical step since smooth logistics processes can only take place in suitable space located in a suitable environment. We are “real estate brokers with a difference” because we take an integrated approach as opposed to only thinking warehouses. We are a partner who considers himself a “co-entrepreneur” in the same boat with his clients helping them steer in the right direction. Logivest – Opening up the gates to the logistics property that perfectly suits your needs. Please refer to our german database if you are looking for logistics property in specific regions. Advice, brokerage and support, from the contract negotiations phase through to the signing of an agreement. On request, we also offer in cooperation with our marketing partners accompanying marketing and PR measures such as site marketing, media communication and public relations, both locally and nationally, the production of brochures, flyers, etc., the development of a website for your property including on-going support and maintenance, and, where applicable, the staging of local events. YOU WOULD LIKE US TO HELP YOU FIND A SUITABLE TENANT OR PROSPECTIVE BUYER? Find the right person of contact for specific regions. Looking for a tenant for your logistics space? Contact us.